The British Film Guides are a fresh departure for the Cinema and Society series, each telling the story of an important British film, presented and priced for a readership spanning scholars, students and general film enthusiasts. These compact guides, based on new and original research, present each film's historical and cinematic context within its decade, genre and director's body of work; details of its production history; a full analysis of the film itself; and a survey of critical response to the film up to the present. Combining humour and thrills in equal measure, The 39 Steps (1935) is one of Alfred Hitchcock's masterpieces. The film established Hitchcock's reputation internationally as 'the master of suspense'. It also inspired two remakes, in 1959 and again in 1978. 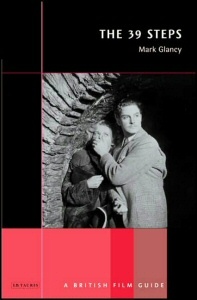 Mark Glancy's fresh reassessment of the film examines the work of screenwriter Charles Bennett and precedents set in Hitchcock's earlier films. It follows the intriguing circumstances of its production and presents an original and close analysis of the film itself. It also explores the film's critical and cinematic legacies. This is a revealing and highly readable new account of a landmark British film. Hitchcock Annual (2002) - Book Reviews: "The 39 Steps"